The future of sports is eSports, and it’s made up of the most elite professional video gamers in the world. It may sound strange that video games have become a sport profession, but people across the world are earning millions playing video games professionally. With the rise of any sport comes betting and eSports betting is emerging as a titan in the bookie industry. League of Legends (LOL): this MOBA game is the most popular eSports game around. 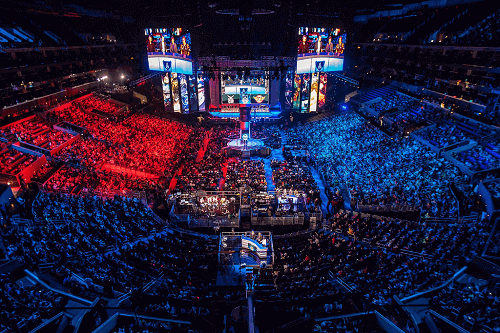 The LOL World Championships in 2014 was the most viewed eSports event in history. It has a massive fan base with players ranging in the millions every month. Counter-Strike:Global Offensive (CS: GO): this multi-player FPS game was launched in 2012.While the original title was first launched in 1999. Its popularity hasn’t died down with the first CS having 540 tournaments. CS: GO has had 615 tournaments over the past three years and awarded US$4 million (R55 million). Dota 2: not as popular as the two previously mentioned video games, Dota 2 is the most lucrative eSports game in the world. All of the top ten highest paid eSports players play Dota 2. Furthermore, the biggest prize pool in eSports history was won at a Dota 2 tournament – over US$10 million (R139 million). Where can I Place eSports Bets in South Africa? With eSports growing in popularity so quickly, the demand for eSports betting had equally grown. South Africans can now bet on their favourite eSports tournaments and players through South African bookmakers. World Sport Betting: This betting site not only offers eSports betting but live streaming too. Not many international books offer this service. World Sport Betting has a R100 welcome bonus when you sign up for eSports betting. Playabets: Playabets has a wide eSports offering. If you’re considering signing up for eSports betting, they have a great welcome bonus. Olimp: They have an impressive offering of the eSports market on their site. Also, be on the lookout for their live eSports betting. Sunbet: This site may not have an extensive offering, but they do cover the basics. Hollywoodbets: eSports betting is now a permanent feature on Hollywoodbets. Learn more about sports betting with our comprehensive guide on popular sports betting in South Africa.